"A Titan once tried to punch the Anomaly until it opened." "Nothing. But one day later—TO THE SECOND—a WarSat fell on her head. Boom. Direct hit. B-line from low orbit to her skull. Coincidence? Maybe." "Yeah. But she never punched that Anomaly again." The Anomaly is a Crucible map located in the Mare Cognitum region on the Moon. In the distance, brief flashes of light from unknown sources can be seen across the surface of Luna. Lunar rovers are also present, but strangely no human remains are found. One of the rovers can also be seen stranded heading away from the facility in the distance. "Our greatest enemy is the unknown." Documents recovered on-site listed this research station only as "K1", although the location was hard to keep secret, given the intense electromagnetic fluctuations emanating from what City scholars have come to know as the Anomaly. Attempts to scan the Anomaly itself have proven futile, as the casing is constructed in a manner that defies modern techniques. Reports suggest that those who spent time in proximity to the Anomaly reported symptoms of insomnia, some so severe they required hospitalization. It was the City's recommendation that only remote sensing equipment be used until such time that a full review of the existing data could be completed. In the meantime, stewardship of the facility was handed over to the Guardians in order to maintain a watch against the Hive forces that will inevitably come in search of this mysterious power. The main characteristic of map is the rotating center platform in the center of the map. Skilled and mobile players can navigate through he center and quickly reach any other location on the map very quickly. Due to the narrow hallways and sharp corners in the middle sections of the area, Shotguns and and Sidearms are highly effective. The middle has two main areas, Point B and the perch. Point B is out in the open, and is venerable from fire from the perch across the map, while the perch has more cover and is a good vantage point to attack from. The outermost areas of the map are long stretches, with some cover and variable ceiling heights. These area are more effective for long game play and firefights at a distance. Point A and Point C spawn on opposite sides of the outer areas, and Heavy Ammo Spawns at both points. In Elimination, Heavy Ammo instead spawns up at Point B. 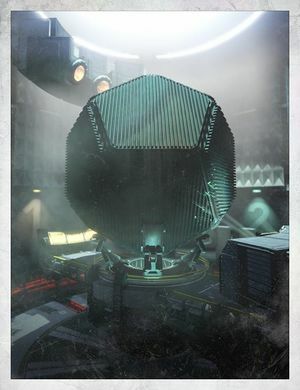 The black dodecahedron in the middle of the map has a similar architecture as the triangle-shaped ships seen in the ending cutscene of Destiny 2. A map of the arena.